Shenandoah's Eclectic Scribblings: So ... what now? It's nearing midnight on the second day of September, incidentally the ninth birthday of my ninth and youngest baby. :-) I've officially been a published author for two days, according to Amazon and the publisher's listed release date. Well, the interviews and giveaways continue, in various places. (Keep checking my page "the scoop" for events and appearances.) I'm respond to blog comments, emails, and social media messages as I can. And, of course, I can't neglect my actual writing. On a wider scale, I have some difficult decisions to make. Some of these will hopefully be decided by the upcoming ACFW conference. I'd like to find homes for my other stories, and I'm still in search of an agent. It may be a bit sporadic, because I'm also still homeschooling my five younger kids, while remaining "mom" to my married daughter and two sons away at college. In the meantime, you can still find me every Sunday at The Borrowed Book, which is a fantastic blog, by the way, if you've never checked it out, with author interviews, reviews, and historical research snippets. 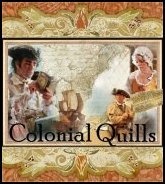 And occasional posts at Colonial Quills, which is another wonderful resource. For now, I want to say thank you to those who have been here, and offer a welcome to anyone who might be wandering past for the first time. I hope you find food for thought, and a blessing for your heart and spirit. I look forward to reading more of your eclectic opining, Shannon! So happy for you, Shannon! I didn't know your book had released. I'm going to buy it now! Thanks so much, Roxanne!! I still remember that awesome hug from last year after I walked down off the stage. :-) Will you be in Indianapolis?